SALE! Kimono and Accessory Sale! I was recently asked to do a basic kitsuke workshop at the Johrei center. 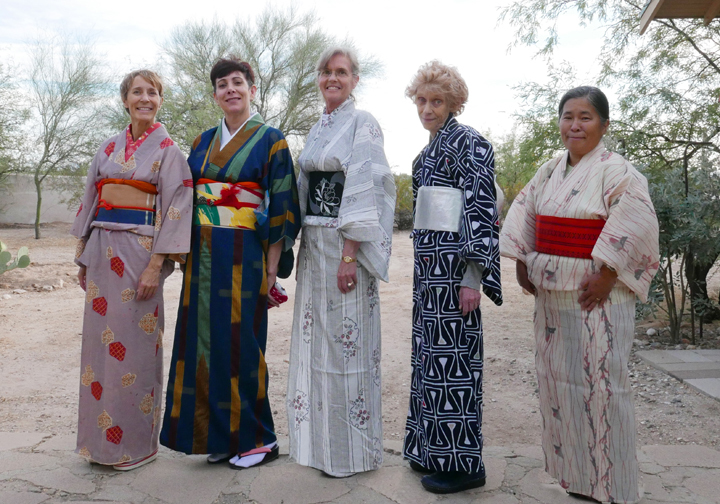 The ladies are learning tea ceremony and were interested in dressing in yukata and kimono. 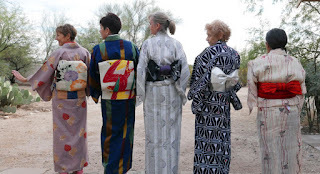 Some of the ladies had their own kimono and obi but didn't know where to start. 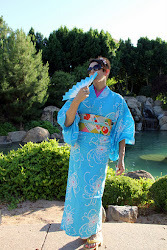 I showed up dressed in my recently acquired blue stripe komon and bird obi. They were thrilled and excited to learn. I dressed the lady who initiated this project in one of my kimono, obi, and accessories while the others watched and asked a lot of questions. I demonstrated the two most basic hanhaba obi musubi (bunko and kai no kuchi) then they dressed themselves in yukata I brought with me. One lady had her own yukata and hakata obi but it might have been a summer kimono. It was difficult to tell! The ladies were really appreciative and I hope they had as much fun as I did. It was a truly nice experience and we all had a great time playing with kimono. The lady on the far left is wearing my "Atomic potsherd" kimono and the lovely double-sided Nagoya obi. That's me, second from the left, in my vintage bird obi. Yes, it's taiko....but we are wearing Happi Coats! Wellcome to Mugi's Kimono World !